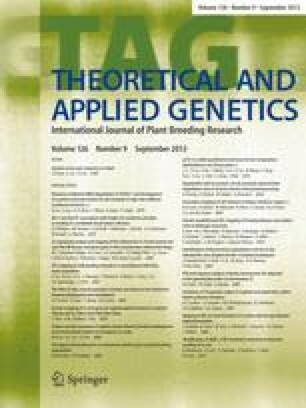 Genetic diversity in 38 genotypes, representing 28 individual genotypes from five landraces of Isatis tinctoria (three German: Tubingen, Potsdam and Erfurt, one Swiss and one English), five genotypes of Isatis indigotica (Chinese woad) and five genotypes of Isatis glauca, were investigated using AFLP analysis. Five primer combinations detected a total of 502 fragments of which 436 (86.9%) were polymorphic. The level of polymorphism recorded within each species was 29.8, 86.9 and 35.8% for I. indigotica, I. tinctoria and I. glauca, respectively. Clearly, genetic diversity within I. tinctoria was greater than that observed in I. indigotica or I. glauca. Cluster analyses of the AFLP data using UPGMA and PCO revealed the complete separation of the genotypes of each species into distinct groups. I. indigotica separated as an entirely independent group, whereas I. glauca formed a separate cluster within the I. tinctoria group. Indeed, I. tinctoria and I. glauca are more closely related to each other than either is to I. indigotica. In addition, the genotypes of each landrace, apart from one from the English group, were clearly discriminated. However, the anomalous genotype did associate with the rest of its group when it was linked with the Erfurt group. These results provide new and useful information about the make-up of the Isatis genome, which has not previously been evaluated. They will be useful in the selection of plant material for variety development and conservation of the gene-pool.